In this cool T-shirt design, Labyrinth collides with Star Wars. 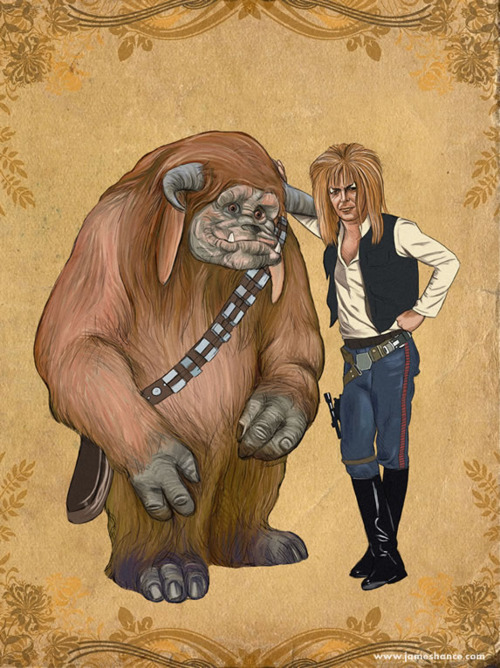 Labyrinth, the 1986 cult classic film directed by Jim Henson, is in our not-so-humble opinion, a work of truly inspiring fantasy from the legendary late puppeteer. Not only were we left with the legacy of iconic visual of David Bowie's Jareth the Goblin King, we were first introduced with the revelation of Jennifer Connelly, who only fulfilled her potential a decade after the film. 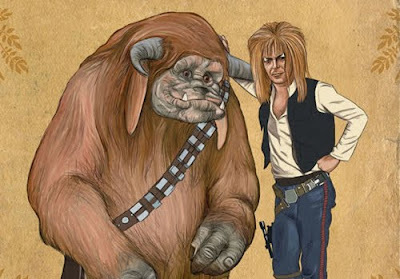 In this cool t-shirt design by artist James Hance, who have earlier brought us "FireFrog", the mash-up design of the Muppets with Joss Whedon's cult TV series, Firefly, the characters of Star Wars collides with those of Labyrinth into some truly hilarious mash-up characters. Prints of the design, are available at $10 at the artist's website while the t-shirts are available at 25 bucks at RedBubble. What Are You Building, Stark? Grand Theft Auto V: First Trailer!